Using a Presto® popcorn popper, prepare popcorn as directed, removing any unpopped kernels. 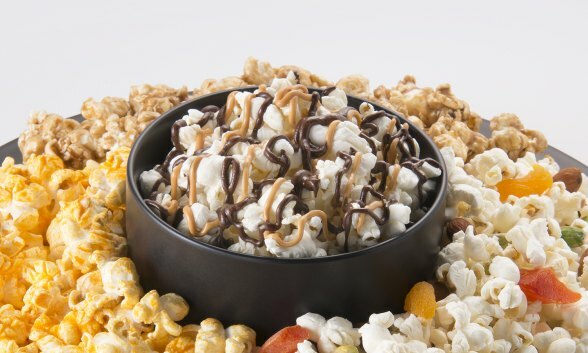 Spread popcorn out on cookie sheet or arrange on platter. In microwave, melt butterscotch chips and 1/2 teaspoon shortening at Medium setting for 30 seconds. Remove and stir. Return to microwave for an additional 10 seconds at Medium setting, stirring after each heating until chips are melted and smooth when stirred, being careful not to overcook. Transfer to sturdy plastic sandwich bag. Cut off a corner from the bag. Drizzle over popcorn sparingly. In microwave, melt chocolate chips and 1/2 teaspoon shortening at Medium setting for 30 seconds. Remove and stir. Return to microwave for an additional 10 seconds at Medium setting stirring after each heating until chips are melted and smooth when stirred, being careful not to overcook. Transfer to sturdy plastic sandwich bag. Cut off a corner from the bag. Drizzle over popcorn. Let cool.